Salzburg is a dream in the summer: Salzburg Festival, top cuisine, the sun-drenched Old Town and gardens for guests, which could not be cosier! But there are also beaches here, particularly beautiful beaches! Regardless of whether you would like to lie in the sun, play beach volleyball in a park or surf on a wave in sight of the Untersberg mountain range – you will find all this and much more in and around the city of Mozart throughout summer. It’s time to pay a visit to the 6 city beaches! The Salzach river is undoubtedly Salzburg’s most popular, diversified and also longest city beach. It stretches over many kilometres through the most varying neighbourhoods, but repeatedly changes its face and thus ensures that everyone will discover their perfect little spot here. Past stately villas and pretty homes, idyllic forested areas and the world-famous historic Old Town you’ll find countless places, meadows, gentle hillsides and bridges where you can enjoy summer to the fullest. Friends meet to play music together on the footbridge over the river, students spend the time between lectures in the sun, families play on the gravel bars along the river near the Mülln neighbourhood and joggers run along the river with a view of the fortress. Hustle and bustle prevails all day long in the gardens of cafes and restaurants; the Salzach River Bike Path resembles a pulsating lifeline, and in the evening, it seems as if the whole city meets to savour a sunset on the banks of the Salzach river in the inner city. Accessible from all parts of the city with various trolleybus lines. 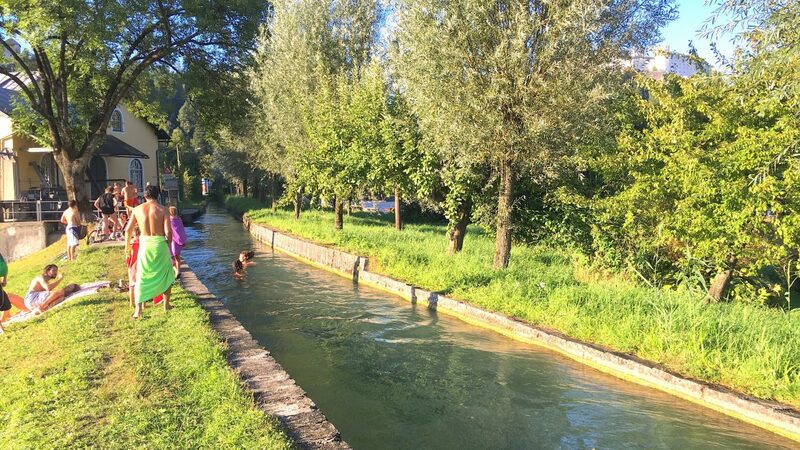 Even if the Alm Canal has supplied the city with fresh water from the Untersberg region for a long time and was regarded as a technical masterpiece during its construction at the end of the 13th century, residents of Salzburg love “their Alm” mainly as a city beach. The narrow canal starts directly behind the Festungsberg (‘Fortress Hill’) not far from the inner city, and meanders southwards through the Nonntal and Gneis neighbourhoods, past residential areas, over green meadows and through small, idyllic forests. What happens here on hot days in the summer can be referred to without exaggeration as an ‘urban beach feeling’. Sun worshipers romp about in groups by the water, youngsters play football and volleyball in the shade of trees, and lovers seek secluded spots for cosy togetherness. The water shimmers in the most beautiful shade of blue; the slight current is ideally suitable for swimming and in some places the particularly courageous jump from bridges into the water. The panorama on the back side of the fortress and the mighty Untersberg complete the picture and make the Alm Canal one of Salzburg’s most popular city beaches. Accessible with trolleybus line 5. Whereas historic water riders of Salzburg rode every day from the springs in Fürstenbrunn to the Residence in order to provide the powerful prince-archbishops with the finest water from the Untersberg mountain range, modern “water riders” of the 21st century ride on waves instead of horses. 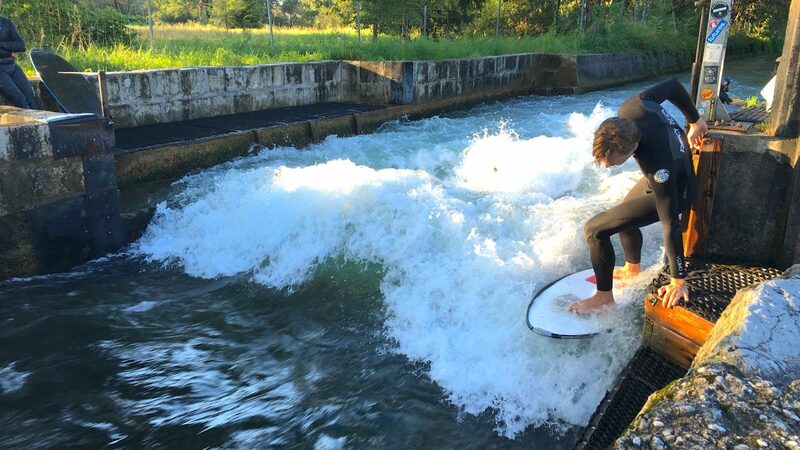 Since the surfing wave on the Alm Canal was opened in 2010, the city has gained another popular attraction. Many passionate surfers meet here every day in order to be able to pursue their sport far away from the sea. Surfing in a river is anything but easy. A person needs quite a bit of feeling, balance and also courage to handle the narrow wave. Yet a visit to the “Alm” (another name for the Königsseeache river in the Salzburg area) is also always worth a visit for non-surfers. Here, a person always meets interesting people and incidentally experiences fun and action in the water. The Königsseeache mountain stream is a veritable paradise for all sun-seekers who also feel comfortable in cool water. After it channels its way from Lake Königssee in Bavaria over the border into SalzburgerLand, it flows into the Salzach river near Rif/Niederalm. Hardly any other river is as idyllic and picturesque as the Königsseeache at this point. Situated in the midst of green forests and blessed with glistening, crystal-clear water, it has always been a very special city beach for people south of the city of Mozart. The water comes from the mountain world of the Watzmann mountain range, is of best quality and is also extremely refreshing in the summer. There are countless spots here by the water. Some people spread their towels out in the small coves, while others sunbathe on the sandbanks, and some even enjoy the shade of trees a few metres away from the riverbank. Riders and their horses stroll along the trails, laughing children play tag in the forest, and many people take a nap in their hammock. Accessible with bus No. 35. Throughout the summer, there is a real beach for Salzburg residents and their guests in the Volksgarten (public garden): the Salzbeach! Caribbean sounds from May to September, a real sand beach along the shores of the public garden and beach known as “Volksgartenweiher”, beach volleyball courts and beach soccer fields on which fun games are held, an active zone with a course for runners and an obstacle course park as well as a chill zone on the northern shore of the pond ensure that comfort and action balance each other wonderfully. A cultural programme is also provided. Bands and actors perform on the ‘open stage’, and after sunset, the summer cinema presents exciting and inspiring films which can be voted on in advance starting in the spring. Accessible with the trolleybus lines 6,7,10 & 12. 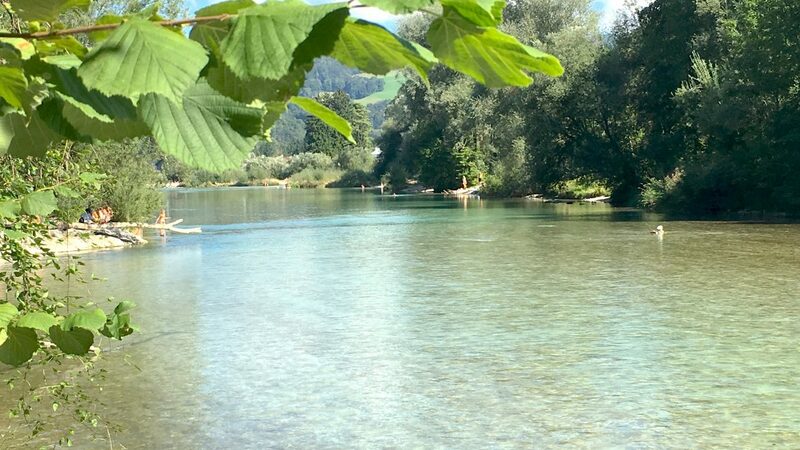 A summer feeling and a veritable leisure paradise await visitors at the swimming lake known as Lieferinger Badesee, the smallest of the three artificial lakes next to the banks of the Salzach river. The approx. 90,000 m² leisure area is one of the largest recreation areas in the metropolitan area and attracts people from all parts of the city, especially in the summer. In addition to the large swimming lake, which is exclusively fed with groundwater, spacious sunbathing areas for relaxing and chilling, volleyball courts and football pitches as well as a popular playground ensure that there is something here for everyone. Two kiosks also provide creature comforts for guests and wonderfully round off the variety of activities at Salzachsee. For those who would rather be out and about than lying by the water, walkways suitable for prams and wheelchairs lead around all three lakes. Accessible with trolleybus line 7.